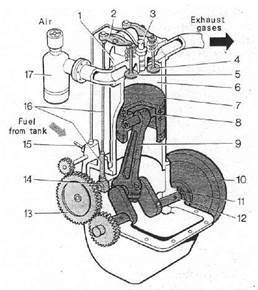 WORKING CYCLE OF THE FOUR-STROKE DIESEL ENGINE. (g) by the cylinder arrangement: single-row engines and double-row engines including V-type ones in which the two rows of cylinders are arranged at an angle to each other. It takes oxygen to burn the fuel; therefore the latter is mixed with air. A mixture of atomized fuel and air in certain proportions by weight is called air-fuel mixture. The air-fuel mixture entering a cylinder of a running engine intermingles with unscavenged exhaust gases and thus forms what is known as the combustible charge. Engines using a special device – carburetor – to mix fuel with air are referred to as carburetor engines. In such engines, the air-fuel mixture is ignited by a spark. In diesel engines, the air-fuel mixture forms inside the cylinder and is self-ignited by the heat of compressed air. Carburetor engines are used mainly on light and medium trucks and cars and also on tractors where they serve to start the main engines. The main engines powering modern tractors and heavy trucks are of the diesel type. Referring to the simplified diagram of Fig. 1, consider the operation of the diesel engine. Piston 7 is placed inside cylinder 6. The piston is attached to crankshaft 12 through the intermediary of connecting rod 9. If the piston is moved up and down in the cylinder, this up-and-down, or reciprocating, motion of the piston is changed into the rotary motion of the crankshaft by the connecting rod and the crank of the shaft. Flywheel 10 fastened to the rear end of the crankshaft serves to make the shaft revolve uniformly when the engine is running. The cylinder is tightly closed at the top by cylinder head 1 housing two valves. Intake valve 5 admits air into the cylinder and exhaust valve 4 lets the burnt gases out. The valves are held closed by valve springs and are made to open by means of rocker arms 2 which are actuated by camshaft 14 through intermediate components (valve lifters and push-rods). The camshaft and the fuel injection pump shaft are driven by the crankshaft through gears 13. The fuel supplied by the fuel injection pump is injected into the cylinder through fuel injector 3. The carburetor engine differs from the single-cylinder diesel engine shown in Fig. 1 in that the intake port closed by valve 5 serves to admit air-fuel mixture into the cylinder and a spark plug takes the place of the fuel injector in the cylinder head. The piston, while reciprocating inside the cylinder, can occupy two extreme positions (Fig. 7). The uppermost position of the piston is termed the top dead center (TDC), while the lowermost position is referred to as the bottom dead center (BDC). The distance travelled by the piston from one dead center to the other is called the piston stroke. During one piston stroke the crankshaft rotates half a turn. The space between the cylinder head and the piston at the top dead center is known as the combustion, or compression, chamber and the volume of this space is referred to as the clearance volume. 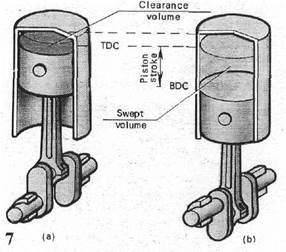 The volume displaced by the piston as it moves from the bottom dead center to the top dead center is termed the displacement, also known as the swept, or stroke, volume. The displacement of an engine cylinder is measured in liters. The displacement of all the cylinders of an engine is termed the engine displacement, or capacity. It is measured in cubic centimeters in small-displacement (up to 11) engines and in liters in large-displacement ones. The total volume enclosed above the piston at the bottom dead center, i.e., the clearance volume plus swept volume, is called the air volume. The number showing how many times the clearance volume is the air volume, i.e., the ratio between the air volume and clearance volume, is known as the compression ratio. In modern carburetor engines, the compression ratio ranges from 6 (6:1) to 9 (9:1), reaching 15 (15:1) to 20 (20:1) in diesel engines. A number of events occur in the cylinder of a running engine. First the cylinder is filled with an air-fuel mixture or air. Then the mixture or air is compressed. 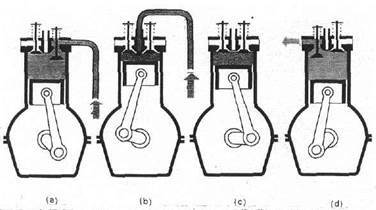 After igniting, the mixture of fuel and air burns and the gases formed as a result expand, push on the piston, and make it move, thus performing mechanical work. Then the burnt gases are purged from the cylinder. The above events are continuously repeated in a definite sequence all the time the engine is running and constitute the working cycle, or the cycle of operations, of the engine. An event (a part of the engine cycle) that occurs in the engine cylinder during one piston travel is called a stroke. The engine which completes its working cycle in four strokes of the piston is known as the four-stroke-cycle, or simply four-stroke or four-cycle, engine. Let us consider the sequence of events occurring in one of the cylinders of the running engine. The piston is moved by the crankshaft and connecting rod downwards and, acting like a pump piston, it produces a vacuum in the cylinder. Fresh air is taken into the cylinder through the open intake valve, as a result of the pressure differential between the cylinder and atmospheric air. The exhaust valve is closed. At the end of the intake stroke, the intake valve closes. The pressure in the cylinder at the end of the intake stroke comes to an average of 0.08 to 0.095 MPa and the air temperature, 30 to 50°C. The crankshaft continues to rotate, so the piston, after passing BDC at the end of the intake stroke, starts moving upwards. Since both the intake and the exhaust valves are closed, the piston compresses the air in the cylinder. As the air is compressed, its temperature goes up. The compression ratio of the diesel engine being fairly high, the pressure in the cylinder rises up to 4 MPa and the air gets heated up to 600°C. As the piston nears TDC at the end of the compression stroke, a charge of finely atomized diesel fuel is injected into the cylinder through the fuel injector. On coming into contact with the hot compressed air in the cylinder, fine fuel particles are self-ignited. The injection and burning of fuel go on for some time after the piston has passed TDC at the beginning of the power stroke. Because of a delay in the self-ignition of fuel, it burns mainly during this piston stroke. During the power stroke, both valves are closed. The temperature of combustion gases reaches 2000°C and the pressure in the cylinder increases up to 8 MPa. The high pressure of expanding gases pushes the piston downward. The piston transmits this push through the connecting rod to the crankshaft, making the latter perform mechanical work. As the piston reaches BDC on the power stroke, the exhaust valve opens to release the burnt gases under an excessive pressure. The piston then moves upwards again and pushes all of the exhaust gas from the cylinder. Finally, as the piston reaches TDC on the exhaust stroke, the exhaust valve closes and the intake valve opens. The piston then moves downwards once more on another intake stroke, and the cycle of events in the cylinder is then repeated. Before the engine has fired, the crankshaft is rotated by means of an external power source, e.g., an electrical starter motor or a starting engine, since energy is necessarily required to perform the initial intake and compression strokes.